The Sachs, French made, Aris (Advanced Rider Index System) freewheel has taken off in popularity, because it is well thought out and crafted, but most of all the thickness of the cog and the spacing make it trouble free with index systems other than ARIS including, Campagnolo Synchro, Mavic, Shimano SIS & HG systems, and Suntour Accushift. And if that weren't enough, (and golly gosh, it ought to be), it will of course work with every friction shift system ever made! 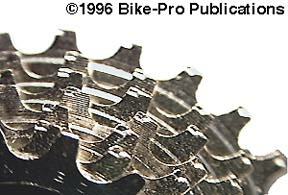 The cogs measured by micrometer to a 1.9mm thickness, while the spacers are 3.0mm thick, well within the machine tolerances of bicycle parts to be compatible with all the previously described index systems. There are thirty-eight 3.0mm steel ball bearings that make the inner bearing assembly, again revolving on two polished surfaces. The Aris freewheel uses two steel pawls held in place and operated by a circular wire spring. There are no lubrication ports on the freewheel body to permit external lubrication of the bearing cavity, you will have to take it apart, or use a Phil Wood grease injector to re-lubricate it. Sachs chose to use the Shimano freewheel notch pattern for their freewheel, so a Shimano TL-FW30 or a Park FR-1 freewheel removal tool will be the proper removal tool. 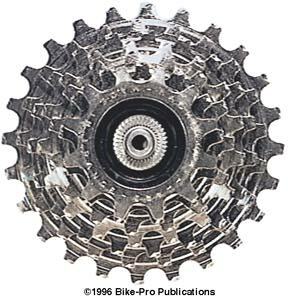 Sachs naturally recommends the use of their Sachs-Sedis chains with this freewheel, but this isn't viewed as a necessity. This freewheel is available in 6, 7 or 8 speed models, the sprocket combinations follow. There is very limited availability of the 6 speed freewheels.